NBA G League is at the halfway of the Regular Season and there are still another 63 rounds left. Here is the last round review presented by ESL. Top ranked OKC Blue (20-7) recorded its seventh loss in Oklahoma City on Sunday night. Hosts were defeated by second ranked Sioux Falls Skyforce (18-10) 119-107. It may be a crucial game in the contest for the top position in the league. Sioux Falls Skyforce looked well-organized offensively handing out 31 assists. The best player for the winners was guard Charles Cooke (196-94, college: Dayton) who scored 31 points, 9 rebounds and 7 assists. Forward Emanuel Terry (206-95, college: Lincoln Memorial) chipped in 31 points and 8 rebounds (on 14-of-18 shooting from the field). At the other side the best for losing team was guard Abdul Gaddy (193-92, college: Washington) who recorded a double-double by scoring 17 points and 16 assists. Sioux Falls Skyforce maintains second place with 18-10 record having just nine point less than leader Windy City B. OKC Blue at the other side still keeps top position with seven games lost. Both teams do not play next round, which will be an opportunity for some rest. Important game to mention about took place in Grand Rapids. Third ranked Drive (11-13) saved a 2-point victory at home edging 4th placed Wolves (9-17) 110-108 in the game for the third place. It was a good game for guard Marcus Thornton (193-87, college: LSU) who led his team to a victory with 32 points. Johnny Hamilton contributed with 15 points and 15 rebounds for the winners. Forward William Lee (203-95, college: UAB) answered with a double-double by scoring 17 points and 16 rebounds for Wolves. Both coaches used bench players in such tough game. Drive maintains third place with 11-13 record having just two points less than leader Windy City B. Wolves at the other side keep the fourth position with 17 games lost. Both teams do not play next round, which will be an opportunity for some rest. Very important is a road loss of third ranked Raptors 905 (14-10) against fourth ranked Erie Bay Hawks (12-12) on Sunday night. Visiting Raptors 905 was defeated by Erie Bay Hawks in Erie 124-113. It was a great evening for Alex Poythress who led his team to a victory with a double-double by scoring 26 points, 16 rebounds and 4 assists. The best for the losing side was Chris Boucher with a double-double by scoring 32 points, 17 rebounds and 4 blocks. Erie Bay Hawks moved-up to third place which they share with defeated Raptors 905. 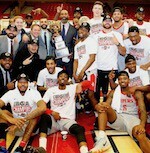 Defending champion Raptors 905 keeps the third position with ten games lost. Both teams do not play next round, which will be an opportunity for some rest. An exciting game between Top Four teams was played in Austin. Second ranked Kings faced 3rd placed Austin Toros. Guests from Stockton (14-9) defeated host Austin Toros (12-14) 116-109. It was an exceptional evening for Kalin Lucas who led the winners and scored 23 points and 8 assists. Both coaches tested many bench players which allowed the starters a little rest for the next games. Kings keep a position of league leader, which they share with Capital City Go-Go. Austin Toros at the other side keep the third place with 14 games lost. Both teams do not play next round, which will be an opportunity for some rest. An exciting game between Top Four teams was played in Austin. Second ranked Kings faced 3rd placed Austin Toros. Guests from Stockton (14-9) defeated host Austin Toros (12-14) 116-109. Kings made 20-of-23 charity shots (87.0 percent) during the game. Strangely Austin Toros outrebounded Kings 43-30 including a 16-4 advantage in offensive rebounds. Their players were unselfish on offense dishing 31 assists comparing to just 15 passes made by Austin Toros' players. Kings brought some defensive toughness making 9 blocks. It was an exceptional evening for point guard Kalin Lucas (185-89, college: Michigan St.) who led the winners and scored 23 points and 8 assists. Troy Williams (201-94, college: Indiana) accounted for 24 points for the winning side. Swingman Lonnie Walker-IV (196-98, college: Miami, FL) came up with 20 points and Nigerian-American forward Chimezie Metu (211-97, college: USC) added 17 points and 7 rebounds respectively for Austin Toros in the defeat. Both teams had four players each who scored in double figures. Both coaches tested many bench players which allowed the starters a little rest for the next games. Kings keep a position of league leader, which they share with Capital City Go-Go. Austin Toros at the other side keep the third place with 14 games lost. Both teams do not play next round, which will be an opportunity for some rest. Important game to mention about took place in Grand Rapids. Third ranked Drive (11-13) saved a 2-point victory at home edging 4th placed Wolves (9-17) 110-108 in the game for the third place. Drive made 27-of-34 charity shots (79.4 percent) during the game. Wolves were plagued by 24 personal fouls down the stretch. It was a good game for guard Marcus Thornton (193-87, college: LSU) who led his team to a victory with 32 points. Trinidad and Tobago center Johnny Hamilton (213-94, college: Texas Arlington) contributed with a double-double by scoring 15 points and 15 rebounds for the winners. Forward William Lee (203-95, college: UAB) answered with a double-double by scoring 17 points and 16 rebounds and forward Hakim Warrick (206-82, college: Syracuse) added 18 points and 11 rebounds (went 8 for 8 at the free throw line) in the effort for Wolves. Four Drive and five Wolves players scored in double figures. Both coaches used bench players in such tough game. Drive maintains third place with 11-13 record having just two points less than leader Windy City B. Wolves at the other side keep the fourth position with 17 games lost. Both teams do not play next round, which will be an opportunity for some rest. Very important is a road loss of third ranked Raptors 905 (14-10) against fourth ranked Erie Bay Hawks (12-12) on Sunday night. Visiting Raptors 905 was defeated by Erie Bay Hawks in Erie 124-113. Erie Bay Hawks looked well-organized offensively handing out 34 assists. Great defensive blocking was one of the keys in this match when Erie Bay Hawks made 8 blocks. It was a great evening for forward Alex Poythress (203-93, college: Kentucky) who led his team to a victory with a double-double by scoring 26 points, 16 rebounds and 4 assists. Guard Jaylen Adams (188-96, college: St.Bonaventure) helped adding 20 points, 8 rebounds and 12 assists. 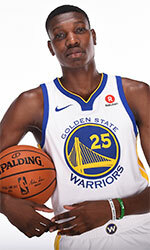 The best for the losing side was Canadian-Saint Lucian power forward Chris Boucher (208-93, college: Oregon) with a double-double by scoring 32 points, 17 rebounds and 4 blocks and South Sudanese-Australian forward Deng Adel (201-97, college: Louisville) produced a double-double by scoring 18 points and 10 rebounds. Both teams had five players each who scored in double figures. Erie Bay Hawks moved-up to third place which they share with defeated Raptors 905. Defending champion Raptors 905 keeps the third position with ten games lost. Both teams do not play next round, which will be an opportunity for some rest. Top ranked OKC Blue (20-7) recorded its seventh loss in Oklahoma City on Sunday night. Hosts were defeated by second ranked Sioux Falls Skyforce (18-10) 119-107. It may be a crucial game in the contest for the top position in the league. Sioux Falls Skyforce looked well-organized offensively handing out 31 assists. The best player for the winners was guard Charles Cooke (196-94, college: Dayton) who scored 31 points, 9 rebounds and 7 assists. Forward Emanuel Terry (206-95, college: Lincoln Memorial) chipped in 31 points and 8 rebounds (on 14-of-18 shooting from the field). At the other side the best for losing team was guard Abdul Gaddy (193-92, college: Washington) who recorded a double-double by scoring 17 points and 16 assists and swingman KJ McDaniels (198-93, college: Clemson) added 21 points and 8 rebounds respectively. Four Sioux Falls Skyforce and five OKC Blue players scored in double figures. Sioux Falls Skyforce maintains second place with 18-10 record having just nine point less than leader Windy City B. OKC Blue at the other side still keeps top position with seven games lost. Both teams do not play next round, which will be an opportunity for some rest.